If you’re like me and most other fishermen I know, when you walk into your favorite tackle department and peruse the selection of offerings you are thinking; “Wasn’t it the pink buzzbait that my buddy Tom caught that nice bunch of fish with?” “Kevin Van Dam just won a tournament on that newly marketed crankbait?” That’s the ticket, it is sure to win me the club tourney this Saturday. If this is your motivation for most of your lure purchases, then before you walk into the tackle shop again and spend some more of your hard earned money, you may want to take some advise from someone who has been there and done that. By examining my reasons for all of these lure purchases, I realized that as a serious fisherman it was more important for me to look at my lures as tools and not toys. If I was going to be a successful bass fisherman, I needed to know not only the right tool use but how to use it and under which conditions. The closest analogy I can think of is mining. If a miner is hired to drill a tunnel through bedrock it would be unproductive to use a bit that is designed to drill through sand or topsoil. The same reasoning applies to bass fishing, lures are designed to be used in certain situations and conditions. To throw a jerkbait with three sets of treble hooks on to a mat of floating moss is the same as attempting to drill through granite with a sand bit. We have to use the proper tool for the conditions at hand. What is the purpose of a lure? To catch fish of course, but a lure cannot be looked at as something you cast into a lake and fish come swimming from all points to eat it. Bass fishing doesn’t work that way. A lure is a tool used to mine fish out of a specific environment. You must analyze the weather conditions, the water conditions, the time of day, the season, the type of body of water i.e. : natural lake, reservoir, or river and form a conclusion. You then make an educated guess as to where the fish will be and only then do you begin to decide what lure you will use. There isn’t a single person on the face of the planet Earth who can tell a bass where it has to be when it is in its own environment. But there are some talented individuals that can read these conditions and predict with a high rate of accuracy where the fish are. These same individuals are smart enough to know; they can’t tell a bass when or what to eat. However, they do know which lures in their tackle box will reach the fish and know how to present them in a manner that will entice a bass to strike. 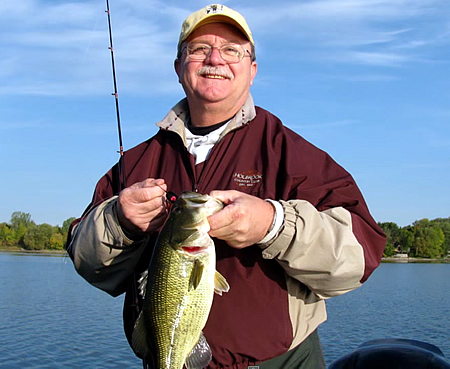 The speed and depth of the lure are two very important factors causing bass to strike. Finding out which speed and what depth to fish are the first two things you have to establish in the course of a days fishing. Once you establish that part of the pattern, you can then fine tune it by adding in other factors such as the type or make up of the structure the fish are relating to on any given day i.e. : weed or wood, points or inside corners. This brings us back to the use of proper tools. To make all this a little simpler, lets break things down to basics. There are three basic speeds; slow, medium, and fast, and three basic depths; shallow, medium and deep. These are relative terms, for example if you find fish at a depth of six feet in a lake that has a maximum depth of seven feet, then that’s deep. Let’s go back to the Van Dam example, if he caught fish using a crankbait that runs ten feet down, what do we really need to know? Since crankbaits are most effective when they are making contact with something, we assume he was finding the fish in seven to ten feet of water. What is missing from the equation? The speed of retrieve. Was he burning the lure, was he reeling it steady at a medium pace or was he just crawling it across the bottom? Once we determine the missing factors we have the framework of the pattern. Finding these factors does require that you use the proper tools. If you think the fish are in a certain depth zone, you can alter the speed of the presentation by using different tools. If those fish wanted a even slower presentation you could show them a jig’n pig. Combing the water at a variety of different speeds until the bass tell you what they want. Then try to fine tune this by introducing finer details such as color, sound and wobble or in the case of jigs, motion. Jig retrieves vary in motion, vertical motion such as hopping or horizontal as in a swimming presentation. This will help you zero in on what the fish want and where they are residing for the day. The recipe for a good day of fishing. This may seem like a lot of thinking to do on a day of recreating. But the more time you spend on the water practicing these techniques it starts to become second nature and you’ll spend much less time organizing expensive lures that don’t seem to work. There is no substitute for experience, the saying goes, and there is no forum better than fishing to prove that axiom true. So the next time you are in the tackle shop, stop for a minute and think about what you are doing. What is that TOOL going to be able to do for you? Pick your tools wisely and then give lake a good drilling! When I saw my first spinnerbait, I found myself asking, “what kind of fish would be stupid enough to strike at a lure like this?” It did not take too long for me to find out! The next day I caught a largemouth bass around 2 pounds and was hooked on the concept. Spinnerbaits come in many forms.